The feast day of St. Patrick has been observed in Ireland on March 17 for hundreds of years. The date falls during the fasting season of Lent, but on St. Patrick's Day the prohibitions against eating meat were lifted, and the Irish would celebrate their patron saint with dancing, drinking, and feasting on the traditional meal of Irish bacon and cabbage. 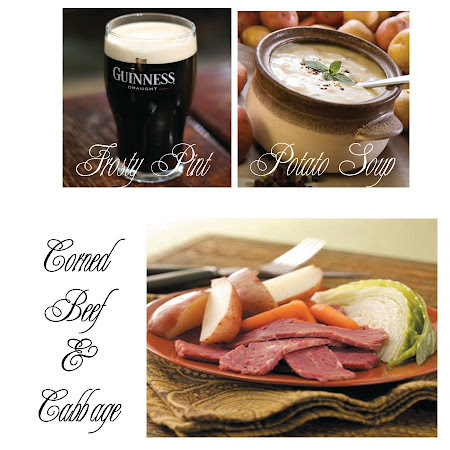 Yes, the custom of eating Corned Beef & Cabbage is enjoyed by many on St. Patrick's Day, but only half of it is truly Irish. Cabbage has long been a staple of the Irish diet, but it was traditionally served with Irish bacon, not corned beef. The corned beef was substituted for bacon by Irish immigrants to the Americas around the turn of the century who could not afford the real thing. But since we have grown accustomed to enjoying this staple stateside for many a year, we'll serve it up at our St. Patrick's Day feast in honor of the impoverished Irish immigrants who came before us! And absolutely, of course, without a doubt...never, ever forget the Guinness. Sláinte! Blend all ingredients together until smooth and yummy. Drizzle some chocolate syrup around your glass. 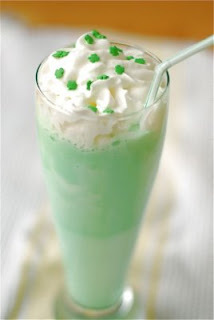 ; pour Shamrock Shake into the glass; top with whipped cream and green sugar...ENJOY! !